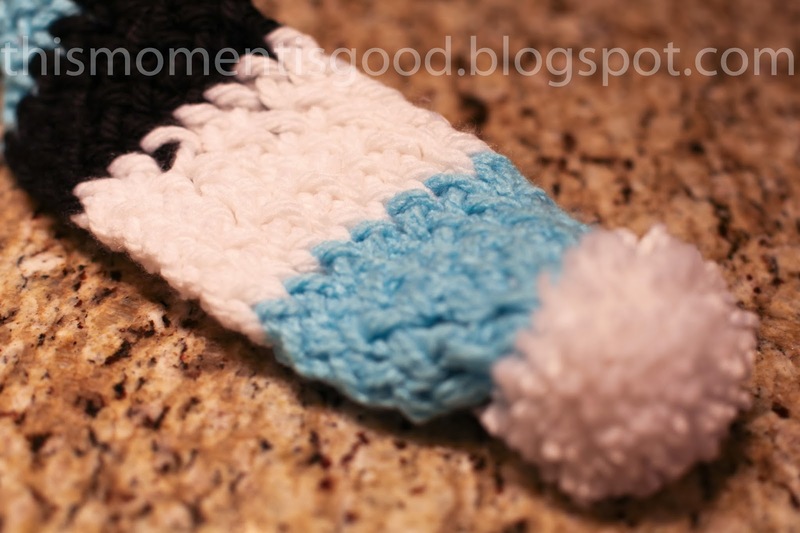 LOOM KNIT: SNOWMAN SCARF | Loom Knitting by This Moment is Good! A couple of weeks ago I created a snowman hat pattern for the loom. Since the hat was meant to be a gift for my nephew at Christmas, I knew I wanted to come up with a pattern for a matching scarf. The first attempt did not go well at all...I tried making a graduated (step) look to the bottom of the scarf. Needless to say, I didn't like the way it was turning out. I pulled all the stitches off the loom and started again. My second attempt did not go well either and again I removed the yarn off the loom. 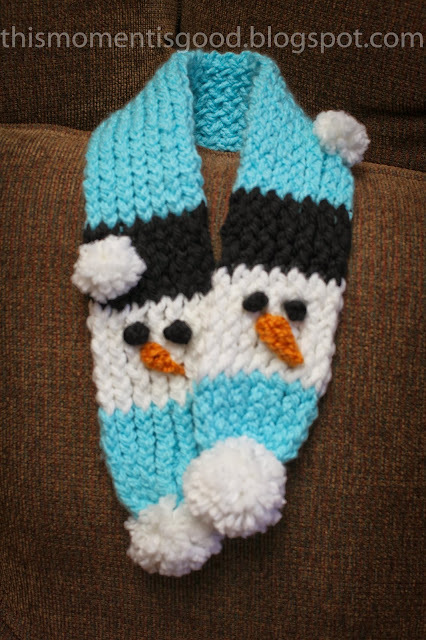 I was frustrated and decided to put off designing the scarf until I was feeling more patient. Yesterday I decided to tackle this project with a fresh look at what I was trying to achieve. I knew I wanted it to look similar to the hat with "snowballs" attached. I found out that sometimes it's best to keep a pattern simple if you want success. My resulting scarf took about 6 hours of work. It will probably take less time with the completed pattern. 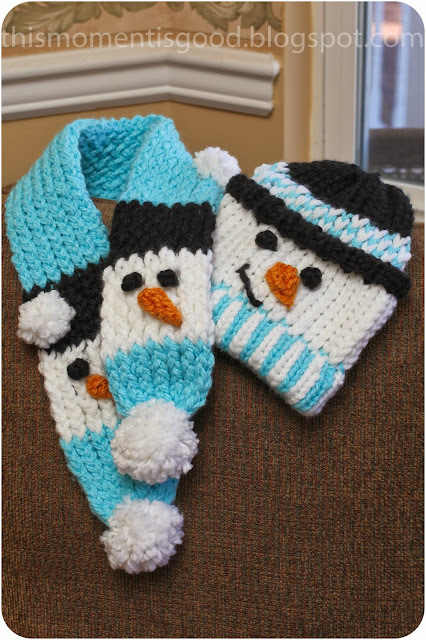 I can't wait to give the set to my nephew...especially since he asked for a "snowman" hat! -With a needle and Aqua yarn (1 Strand), weave yarn in and out of Bind on end and gather end to match bind off end. With BLACK E-Wrap Knit (3) Rows using 3 pegs. 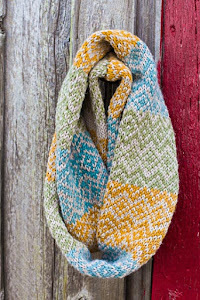 Make two pom poms with the Medium pom pom maker and sew on to gathered ends of scarf. 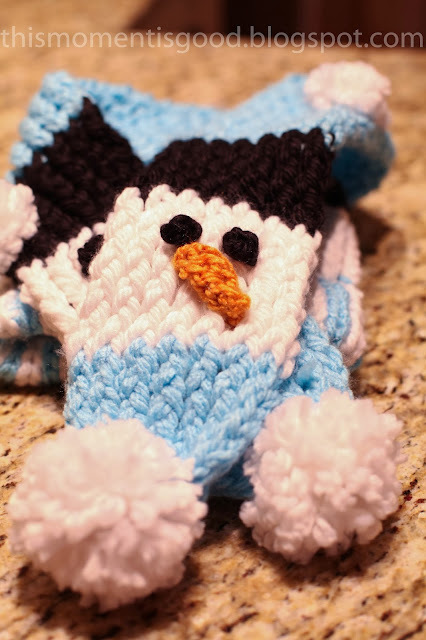 Make two pom poms with the extra small pom pom maker and sew one on to frosty's hat and one above the hat on other side. Snowballs should look random on the scarf. patterns have been tested by me, they are still considered test patterns because they have not been done by a large group of knitters. They are being shared free for this reason. Please knit these patterns at your own risk. Back of scarf after eyes and nose are added, stitches are hidden inside knitting. 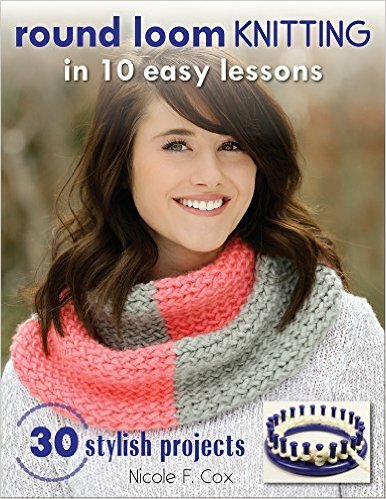 Can I use my round loom knitter.? 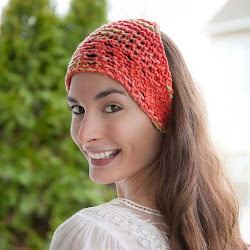 Hello Unknown, you can use a round loom for the hat but will need a straight loom or what's known as a rake for the scarf as it is double knit.